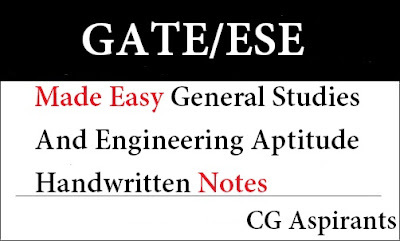 Hello Engineers if you are preparing for gate and ESE Examinations and you want Made easy general studies and engineering aptitude handwritten notes pdf for guidance and analysis of topic then CG Aspirants team share with you download link of general studies and aptitude notes pdf. For download of notes click on subjects a google drive link is open where you can easily download the file. If you like the General Studies And Engineering Aptitude Made Easy Handwritten Notes pdf and you think this notes is useful to your friends then keep share with us. If You have any Queries and suggestion & you want to share Book and Notes which is important to other students then share the URL of the file with the help of CONTACT US Form. Thanx I hope This Handwritten Notes Will Help you!